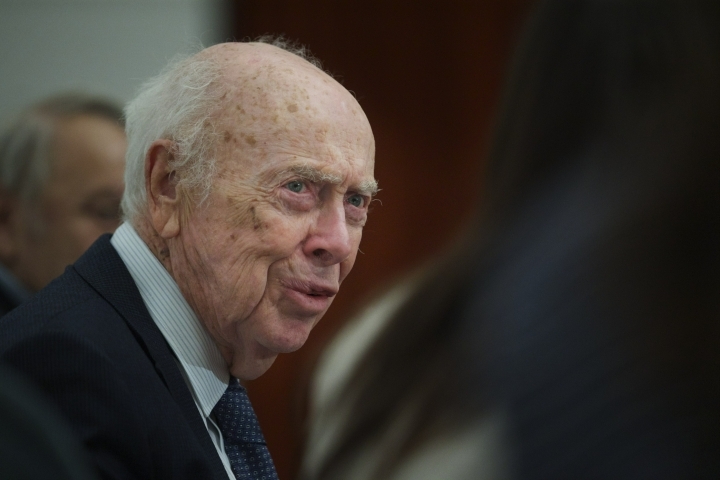 NEW YORK — James Watson, the Nobel Prize-winning DNA scientist who lost his job in 2007 for expressing racist views, was stripped of several honorary titles Friday by the New York lab he once headed. Cold Spring Harbor Laboratory said it was reacting to Watson's remarks in a television documentary aired earlier this month. In the film, Watson said his views about intelligence and race had not changed since 2007, when he told a magazine that he was "inherently gloomy about the prospect of Africa" because "all our social policies are based on the fact that their intelligence is the same as ours — where all the testing says not really." In the 2007 interview, Watson said that while he hopes everyone is equal, "people who have to deal with black employees find this is not true." In this month's documentary, he said genes cause a difference on average between blacks and whites on IQ tests. The laboratory, calling the latest remarks "reprehensible" and "unsupported by science," said they effectively reversed Watson's 2007 written apology and retraction. It said it had revoked three honorary titles, including chancellor emeritus and honorary trustee. Watson's son Rufus said Friday in a telephone interview that his father, who's 90, was in a nursing home following an October car crash, and that his awareness of his surroundings is "very minimal." "My dad's statements might make him out to be a bigot and discriminatory," he said, but that's not true. "They just represent his rather narrow interpretation of genetic destiny." "My dad had made the lab his life, and yet now the lab considers him a liability," he said. The double helix became a widely recognized symbol of science, and Watson himself became famous far beyond scientific circles.